Daisy Duck Donald Duck’s girlfriend had her debut as Donna Duck in Don Donald (1937), but was first known as Daisy in Mr. Duck Steps Out (1940). She made 14 film appearances. Daisy had three nieces in comic book stories—April, May, and June. They first appeared in Walt Disney’s Comics & Stories no. 149 (February 1953). Daisy Duck is a cartoon character created in 1940 by Walt Disney Productions as the girlfriend of Donald Duck. Like Donald, Daisy is an anthropomorphic white duck, but has large eyelashes and ruffled tail feathers to suggest a skirt. She is often seen wearing a hair bow, blouse, and shoes. Daisy usually shows a strong affinity towards Donald, although she is often characterized as being more sophisticated than him. She is often seen wearing a hair bow, blouse, and shoes. Daisy usually shows a strong affinity towards Donald, although she is often characterized as being more sophisticated than him. Daisy was introduced in the short film Mr. Duck Steps Out (1940) and was incorporated into Donald’s comic stories several months later. She appeared in 11 short films between 1940 and 1954, and later in Mickey’s Christmas Carol (1983) and Fantasia 2000 (1999). 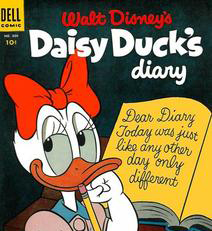 In these roles Daisy was always a supporting character, with the exception of Donald’s Dilemma (1947). Daisy has received considerable more screen time in television, making regular appearances in Quack Pack (1996), Mickey Mouse Works (1999-2000), House of Mouse (2001–2003), and Mickey Mouse Clubhouse (2006–present). Daisy has also appeared in several direct-to-video films such as Mickey’s Once Upon a Christmas (1999) and The Three Musketeers (2004). According Don Rosa’s comic stories, Daisy is related to Donald’s family through marriage, being the sister of Huey, Dewey, and Louie’s father. As such she is also the aunt of the boys. Daisy is also the aunt of April, May, and June, three young girl ducks who act as Huey, Dewey, and Louie’s female counterparts. The girls are the children of Daisy’s other sibling, an unnamed sister. Daisy is a close friend of Clarabelle Cow and Clara Cluck in the comics, and Minnie Mouse’s best friend.